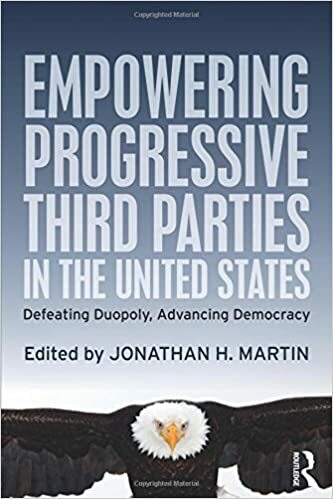 Sondra Miller here reviews the book EMPOWERING PROGRESSIVE THIRD PARTIES IN THE UNITED STATES: Defeating Duopoly, Advancing Democracy. It is edited by Jonathan Martin. Increasingly the only real hope for change is third parties, but it will take real work to enact the change. This book and Sondra look at how to begin. This book is an anthology of essays by various writers on progressive third party and Independent political campaigns and the forces that affect them. The role of labor unions in funding political campaigns is explored, and the case for a national progressive third party to challenge the Democrats and Republicans at the national level is presented. The Socialist Alternative of Seattle describes their successful campaign in electing Kshama Sawant to the Seattle City Council and the Green Party of Portland, Maine recounts their decades of success in electing Greens to public office. The Vermont Progressive Party has been the most successful third Party in recent decades with 14 members elected to the Vermont House of Representatives between 1991 and 2012 and several Party members elected to non-partisan municipal offices. As of 2014 there were 3 Vermont Progressive Party members serving in the Vermont State Senate. The Vermont Progressive Party had its roots in a coalition that supported the efforts of the Independent mayor of Burlington at that time - Bernie Sanders. Sanders had defeated an incumbent Democrat and the Burlington political establishment was in shock. They decided to stonewall Sanders until the “fungus” (as one Democratic City Council President referred to it) could be removed at the next election. The Democrats and Republicans on the Burlington City Council united against Sanders and refused to ratify his appointments or policies. But the rest is history. Bernie was reelected at the next election and more progressives were elected to the City Council. The mayor’s appointments got approved, the city finances got streamlined, and money that formerly went to private businessmen now went for the public good. Sanders went on to be elected Representative to Congress from Vermont and later U.S. Senator. Sanders himself was never a member of the Vermont Progressive Party which formally became a party in 1999. He identified as a democratic socialist but remained a registered Independent throughout his career as Mayor, Congressman and U.S. Senator. It wasn’t until his bid for the Presidency that he ran as a Democrat. Labor unions traditionally supported Democratic candidates over progressive independent ones; however, some breaks with this tradition are noted. In 2013, some Lorain County, Ohio union locals supported some pro-labor candidates for local offices who weren’t endorsed by the Democratic Party, including 3 Independents, all of whom won the election. The Socialist Alternative victory in Seattle was facilitated in part by support from union locals of the AFSCME, the Communication Workers of America, the Postal Workers, the American Federation of Teachers, and the Brotherhood of Electrical Workers. Bernie Sanders also received substantial donations from organized labor for his Congressional campaigns. The successful elections of third parties and Independents described in this book are all of local municipal, district, and statewide elections. And they are from various political parties - including the Socialist Alternative, the Green Party and the Vermont Progressive Party. The argument is presented that we need a national third party that can compete with Democrats and Republicans in the nationwide Presidential election. But the problem is, how to unite all the diverse groups of progressives together under one party? And the solution isn’t easily attainable. My take away from this book is that the empirical facts presented show what is possible when progressives apply themselves to the business of electoral politics. However, in the majority of wards, precincts and Congressional Districts, there are no progressive groups applying themselves to the business of electoral politics. Recruiting candidates and getting them on the ballot has always been the purview of very small groups of people. But in the case of progressives, not even a small group of electoral activists can be found in most Congressional Districts. Most progressives, like average Democrats and Republicans, see electoral politics as a spectator sport to be complained about on social media but not participated in until Election Day, when it is usually too late to have the real choices we need on the ballot.